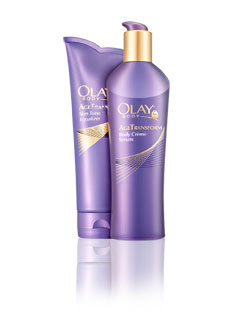 Because it’s gotten a little warmer and I can get away with using a lighter moisturizer, I’ve switched over to Olay Age Transform Creme Serum. Now, my skin doesn’t look that bad as it is, so I’m not going to comment on whether or not I look younger, but I will say that this is a great moisturizer. Because it’s a serum, it’s lighter than say the Quench line which I love so much, but it can still moisturize. It absorbs into skin really quickly and instead of silvery shimmer that’s in Quench, this has shimmer that’s warmer toned – Champagne-shaded almost. This leaves your skin glowy and luminous without being greasy in the least. It’s summertime perfection.